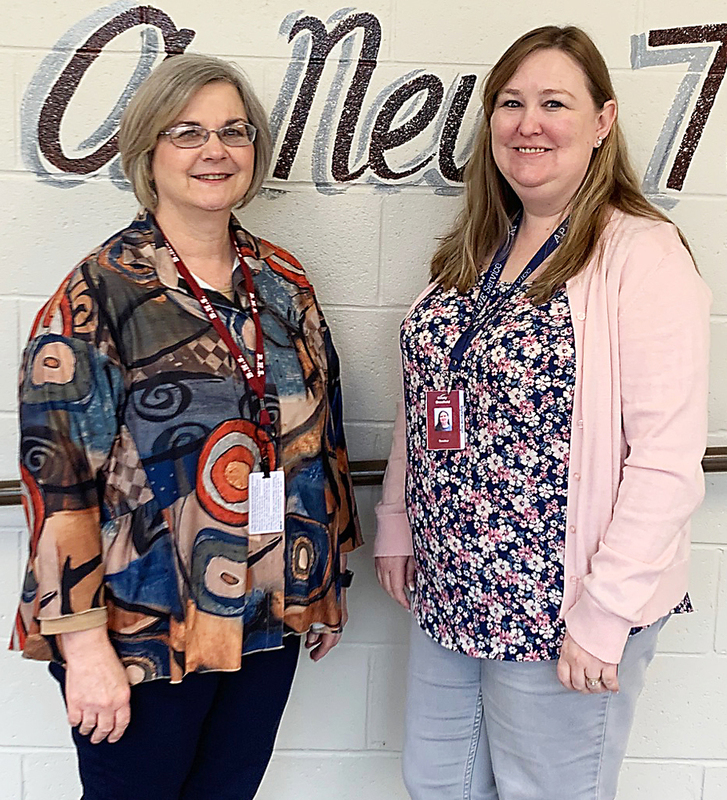 Blytheville High School teachers Dr. Paula Williams (left) and Kristy Brasfield will be two of the presenters at the New Tech Annual Conference July 15-19 in Orlando. Williams’ presentation will be “Project Theater - Designed for Microsoft Access”. Brasfield will have two presentations, “PBL and AP: An Uncommon Combination” and “Effective Project Planning”. Kristy Brasfield and Dr. Paula Williams have been very interested in the New Tech process while working at Blytheville High School New Tech. This summer Brasfield, social studies instructor, will present two sessions and Williams, Career and Technical Education teacher, will present one session at the New Tech Annual Conference July 15-19 at the Hilton Orlando. Brasfield’s first session, “PBL and AP: An Uncommon Combination”, will provide an overview of strategies teachers can use to conduct successful projects in an Advanced Placement history course. Suggested strategies could also be used in an integrated AP History and AP English course. She believes teachers will come away with a handful of strategies to develop and implement project-based learning in AP courses that assist students in preparation to score a “3” or higher on AP exams. The session will also introduce AP with WE Service, offered by CollegeBoard that enables students to conduct community service projects in their AP courses. “The goals of this session will be to help teachers gain the skills necessary to conduct PBL in AP courses,” Brasfield stated. “Teachers will leave the session with a handful of strategies, ideas and resources to design projects in AP History courses, with the ability to use their new knowledge in integrated AP History and English courses. Another goal will be to introduce teachers to the newly offered AP with WE Service program offered by CollegeBoard that blends PBL with AP Key Concepts and community service. Brasfield hopes to show teachers that PBL is possible in AP courses and holds potential for students to become successful on future AP exams. “I will introduce participants to AP with WE Service, and I will share related articles, classroom activities and lesson plans that will help teachers create project-based learning projects within their AP classrooms. I will also introduce teachers to the online community where colleagues collaborate and share resources and ideas. BHS New Tech director Robin Sneed stated that Brasfield has been recognized at BHS as a teacher leader who specializes in sharing valuable resources, and being asked to present will only provide added exposure to BHS New Tech and invaluable experience for Brasfield. “She has been recognized by the New Tech Network as both a New Tech Certified Teacher and a New Tech Certified Trainer,” said Sneed. “As an NTN trainer she is extremely qualified to present these sessions, but is uniquely qualified to present the "PBL and AP: An Uncommon Combination" session. In Brasfield’s second session, “Effective Project Planning”, she plans to guide teachers to plan effective projects using New Tech Resources and the Project Planning toolkit. Her intention is for teachers to walk away with a list of resources and skills to make the most use of the New Tech Project Planning Toolkit. Teachers will be guided through the steps to use content frameworks and backward planning to develop a high-quality project. Brasfield believes this session can be useful for any content or grade level. The session will allow teachers to interact with ECHO and the Project Planning Toolkit, browsing ECHO resources and completing their own project toolkit. The session will allow for participant-led discussion and time for questions. Teachers will participate in small groups discussions around project topics and hands-on activities with the toolkit. “My hope is for participants to walk away knowing that Advanced Placement courses and project-based learning can and do work well together,” she said. “Although AP courses are designed for students to learn the content and skills necessary to pass an AP exam to possibly earn college credit, this can be done by implementing PBL and service learning. She added that her students classified the props by category and began creating a database. They exhibited the use of each of the four objects found in an Access database, and the final product was a presentation that included each object created.